Drug War In Philippines: Duterte Celebrates After Deadly Police Raids : The Two-Way Police raids in the Philippines over a three-day span killed dozens of people suspected of selling or using drugs. They're the bloodiest known days in President Rodrigo Duterte's war on drugs. Relatives of an alleged drug dealer killed during a police anti-drug operation react upon seeing his body in Manila on Thursday. Police in the Philippine capital shot dead more than two dozen drug suspects in another round of anti-drug raids, authorities said, as they followed President Rodrigo Duterte's call for dozens of deaths a day. At least 58 people were killed by police in the Philippines this week in two raids — the first and deadliest of which was celebrated by President Rodrigo Duterte as a successful part of his brutal war on drugs. On Tuesday, a raid in the province of Bulacon left 32 people dead, The Associated Press reports. It was the highest single-day death toll of Duterte's crackdown on the drug trade. More than 100 accused drug offenders were arrested in the province, the news service says. 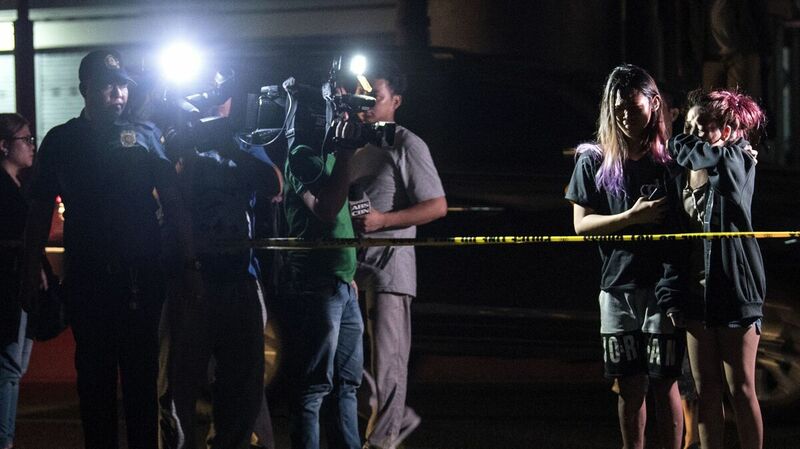 On Wednesday and into Thursday, operations in the capital city of Manila killed 26 more people. In total, there were 84 police operations in the two areas, most carried out by plainclothes officers, Reuters reports. Police say that those killed or arrested were selling drugs, and that the people who were killed "fought back," Reuters says. Duterte's war on drugs was already deadly: Thousands of people have died in the streets, either killed by police or brought down in apparent vigilante killings. The extrajudicial killings have been widely criticized by international groups, but Duterte's support among the Filipino people remains strong. This week was unusually bloody even compared to the carnage of the last year. The raid in Bulacan was the deadliest known single operation in the campaign. "That's good," Duterte said on Wednesday, according to Bloomberg. "If we can only kill 32 every day, then maybe we can reduce what ails this country." The president signaled his satisfaction again on Thursday, Reuters reports. "If the police and the military get into trouble in connection with the performance of duty, you can expect, I really won't agree for you to be jailed," Duterte told police. And he threatened any police personally involved in the drug trade with death. "You policemen who are into drugs ... the bounty I'm offering for your head is 2 million [$40,000], no questions asked. I will not ask who killed you," Duterte said, according to Reuters. Last month, a police raid killed a mayor whom Duterte had previously included on a list of targeted suspects. "Duterte ran for president promising a brutal, bloody war on drugs. And he's delivered. "More than 7,000 alleged drug suspects have died in extrajudicial killings, in encounters with police or gunned down in so-called vigilante killings. The killings have drawn widespread international condemnation, with Human Rights Watch describing Duterte's first year in power as a "human rights calamity." "But here's the thing: Duterte is actually more popular now than when he was elected.
" 'I don't even consider them extrajudicial killings," Bernardo says. "It's a moral killing, in a way. It's like a pest in your house. If you see a cockroach or a mosquito, you'd kill it. For me, if you're a drug user, a drug seller, you're a sickness in society. You need to disappear.' "
Human rights activist Jose Manuel Diokno told Sullivan that many of the killings are unrecorded, and he believes the numbers may be even higher than 7,000 dead — somewhere between 10,000 and 12,000. That was as of late June. Raids and vigilante killings have continued throughout July and August, and the raids this week represent an as-yet unexplained step-up in coordination police actions, Reuters reports.